A long day, but ut was great. More then 1000 geocachers who enjoyed the beautiful weather and the many caches in the neighbourhood. And of course lots of other cachers to talk to. There was something for everyone. We had a lot of interest. We have seen and talked to a lot of known faces. 2 mei 2000 was the day the selective availability was switched off which made the GPS navigation possible for everyone. In America Dave Ulmer thought it would be fun to hide something and publish the GPS coordinaat on the internet. That was the first Geocache. At this moment, there are more then 1 million caches worldwide and there are 3-4 million people participating. To celibrate the 10 years anniversary there are a lot of events world wide. Groundspeak created also a number of products celibrating the 10-years anniversary. There are on the way to us and will be available in our shop in the coming days. Next to that we have a lot of other new products. This Geocoin is about the city Figueira da Foz, which is a popular bathing resort. On the frontside there is the emblem of the city, on the backside there is a sailing ship. The text on the background are some pieces of wisdom regarding sailing. Now in limited antique copper edition. Next to that there are a few black nikcel and antique silver versions left. The first Geocoin dedicated to the city of Porto (Portugal). The city used to be called Cale and later Portucale. The coin represents its history, its exlibris - the bridge over the Douro River and the famous Port wine. Idea and design by Koin Alchemy. Want to contribute to nature which gives so much to you? Then this coin is for you. Proceeds from this coin will be donated to Wildlife Warriors Worldwide Conservation Fund. This coin was developed by the cacher CrotalusRex. Its unique design will make a perfect addition to your collection, or as part of your traveling travelers. You can read more about the fundraiser project at this link. By purchasing this coin, you are directly contributing to a good cause for our precious Earth. 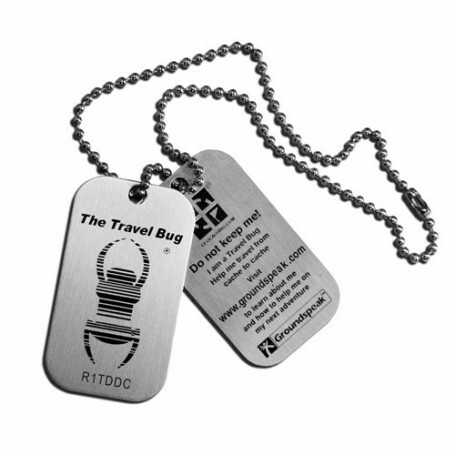 A nice new small trackable in the travel series. A unicorn is a mythological creature. The unicorn is symbolic of chastity or purity. Travel Unicorn is large enough to be seen, but sized just right to fit in a 35mm container. You also can attach your favourite item to it. Are you looking for a number of different cache containers? Next to the Lock&Lock Startsets we have now also Container sets. A nice combination of different sizes cache container with a nice combi-discount. Here you can find all container and sets. Het is bijna 1 mei. Je kunt je ontwerp nog indienen. Wil je weten hoe het werkt? Kijk dan even op onze site onder Geocoin wedstrijd.